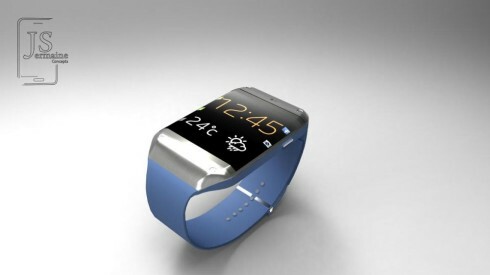 The Samsung Galaxy Gear 2 smartwatch has only been the topic of rumors lately and today it becomes an image, courtesy of a render from Jermaine Smit. He did a fine job, creating a new generation of Samsung watch with a slightly curved screen and a good looking belt. The screen takes up more facade estate now and it reminds me greatly of the Samsung Youm display. The resolution seems to be higher and the image is pretty crisp. The designer created this Samsung Galaxy Gear 2 concept in 3D and the belt is inspired by the first Gear, but it’s also a bit different. The pins you see there must be pressed in certain holes to achieve a certain length of the belt, depending on the size of your wrist. Keep in mind this is only a demo of the Jermaine Smit design and a full render will come soon. In the meantime sources from Korea are saying that the new Gear will come in April or March in London with a completely new design and flexible display. Fingers crossed for also seeing some gestures implemented on it and a kickass front camera.